Still thinking about what to get Dad for Valentine’s Day? Let GreatDad.com guide you with our top recommendations of gift suggestions for dads. And, since we’re dads ourselves, we went beyond the usual suspects of slippers, ties, sports and other predictable presents to offer ideas that will not only surprise him but will let him know that you truly appreciate all he does. 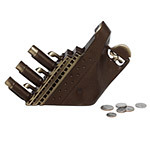 Titanic Bank – $120 Just the thing if he’s ready to trade in the big jar full of pennies. Recordable Photo Frame – $10.99 Yes, it’s “faux” lizard, but it’s a tasteful version of this type of frame that often is just cheap plastic and paper. Make sure to record the kids before you give the frame, or else it’s just one more “thing to do” for dad. Desktop carafe – $50 Make sure dad gets enough water throughout the day while saving the earth from plastic bottles.